Good news for Nurse Practitioners and medical professionals thinking of continuing their education to become a Nurse Practitioner. A study released yesterday by the American Association for Nurse Practitioners. Excellent job growth for Nurse Practitioners is forecast for the years ahead. This is based on growing demand over the last few years. This growth is expected to continue providing lots of job opportunities for Nurse Practitioners. The demand for Nurse Practitioners continues to grow especially in rural areas where there is a shortage of primary care Doctors to provide care. We see demand here in San Diego too as Doctors seek the assistance of a Nurse Practitioners to support their growing practice. 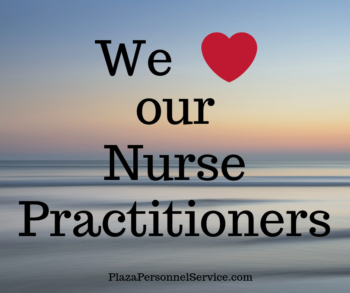 Some Nurse Practitioners work independently providing primary and in some cases specialty care. Many work alongside a Doctor allowing the Doctor to significantly increase their patient population. Patients are becoming increasing more comfortable and confident in seeing a Nurse Practitioner for their medical care. 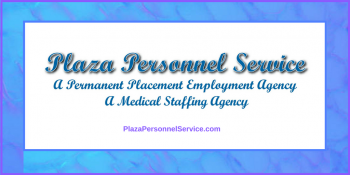 Here at Plaza Personnel Service in San Diego we help Doctors in private practice hire staff to support their practice with Medical Assistants, Medical Receptionists, Insurance Billers, Office Managers as well as Nurse Practitioners and Physician Assistants. Established in 1991, we have helped thousands of Medical Support Staff as well as Providers find a great practice to put their skills to work. Medical staffing in San Diego. Supporting Doctors in private practice with the best staff to help with clinical and administrative duties. Helping Medical Assistants and Nurse Practitioners find a great a place to work. We specialize in permanent placements, not temps. Our goal is to facilitate a long term match between the employer and the employee. For job opportunities offered by Plaza Personnel Service, as well as articles of interest and some fun stuff, please visit our blog at Plaza Personnel Service Blog and check back from time to time. Do you have a favorite social media site? Plaza Personnel Service is on Facebook, Pinterest, Twitter, LinkedIn, YouTube, Instagram and Google. Check us out on your social media site.